Making ice cream is incredibly easy if you have an ice cream maker – and your ice cream maker doesn’t even have to be fancy. 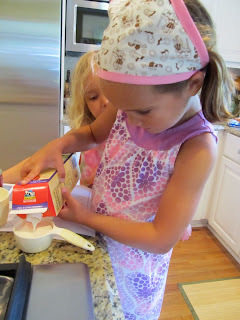 This week we had a head-to-head ice cream making competition – the kids vs. mommy. The children used an ice cream ball from LL Bean. Mommy used her Krups ice cream maker. Surprisingly, the ice cream ball won! (Click here to check out the ice cream ball adventures.) Once you are comfortable making a very simple custard base, you can design just about any flavor you can imagine. In honor of Father’s Day, the kids and I decided to make mint chocolate chip ice cream – Dad’s favorite. I have been keeping some heavy cream on hand, knowing the spirit would move us one day to bust out the ice cream maker now that summer has arrived. In addition to heavy cream, all you really need is some half & half (or milk), some sugar, and a few egg yolks. That’s it. My good friend had given me some extra peppermint leaves last week and I hadn’t put them to good use yet. This was the perfect day. In addition to the basic ingredients for my ice cream base, I also chopped up 15 fresh mint leaves. The taste of the custard itself, before it even became ice cream, was delicious. I found a very simple ice cream custard recipe on a website simply called – make-ice-cream.com – how could I go wrong? 1. Combine cream, half & half, sugar, and mint leaves in a saucepan. Heat over low to medium heat, stirring until the sugar dissolves. 2. In a separate bowl, whisk the egg yolks. 3. Gradually add the warm milk to the egg yolks – a little bit at a time – whisking constantly. When you have added almost all the milk into the egg yolks, pour the combined mixture back into the saucepan and return heat to medium. 4. With a wooden spoon, constantly stir the custard mixture until it thickens – about 5 to 10 minutes. Do not let it overheat. Do not let it boil or the eggs will cook and the mixture will curdle. 5. Cover the liquid with plastic wrap. Let it cool in the fridge for a few hours or even overnight. Do not put it in the freezer. 6. When you are ready to add your custard to the ice cream maker, stir in the mini chocolate chips. Pour in your custard and watch it go! Our ice cream from the ice cream maker was a tad too soft when it came out of the machine so I transferred it to a bowl, covered it with plastic wrap and let it chill for a bit in the freezer. It was ready in no time! ** This recipe should make about a pint of ice cream.